I have a confession to make. 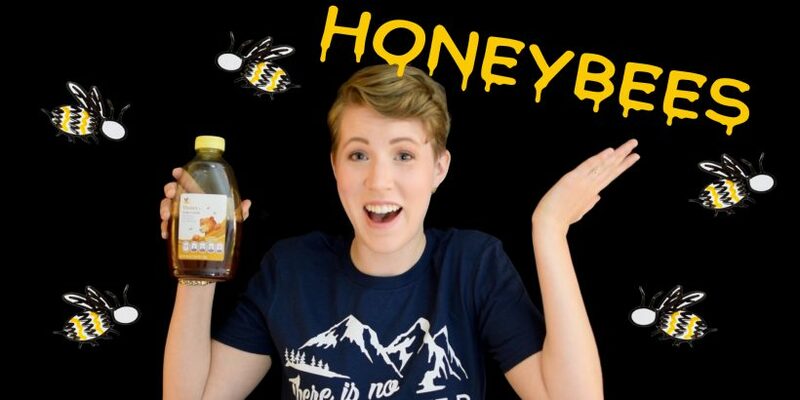 I am hopelessly and desperately in love… with honey! It is the perfect additive that brings my peanut butter sandwiches to the next level. But to get honey, we need honeybees and unfortunately for everyone they aren’t doing too hot right now. There are a huge number of known and unknown factors making bees ride the strugglebus, but researchers from the University of Texas recently published a paper highlighting just one more way bees are getting the short stick and it has to do with antibiotics. One awful disease that bee colonies have to deal with is called American Foulbrood. This disease is caused by a bacteria that eats bee larvae before they can hatch into new bees and it is found almost everywhere in the world. One way that beekeepers stop Foulbrood is by treating with the antibiotic tetracycline. The paper we’re talking about today took a look at what this antibiotic is doing to the honeybee gut bacteria or its microbiota. Spoiler alert: It’s not good for the bees. Honeybee microbiota is surprisingly similar to the human one. They get their gut bacteria from each other rather than through environmental encounters, just like we do. Also, the bacteria in their gut are only found there and not anywhere else. Just like the special bacteria we have in our gut. 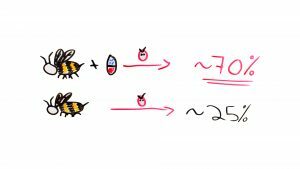 Honeybees are MUCH simpler! While anywhere from 500-1000 bacteria species can live in the human gut, most of the honeybee bacteria is from only 8 species. That’s the difference between planning a small dinner party versus planning a massive wedding! So how is the antibiotic tetracycline effecting the bees? The major effects are in overall size and diversity of the number of bacteria in the honeybees. Bees from the same hive that haven’t been treated with antibiotics have pretty similar microbiota, but bees treated with tetracycline show 5 times less bacteria in their gut and they show less gut diversity overall. 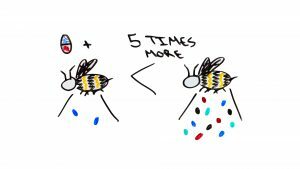 Of the 8 core bacteria species in the bees, 4 are effected heavily and the others show other effects based on the shifting gut population. What do all of these changes mean for the bees? Turns out that having a healthy and diverse microbiota is key to protecting you from infections. To test this, these researchers took antibiotic treated bees and normal bees from the same hive and exposed them to a bacteria called Serratia that’s found in bees. Usually it’s not harmful, but when the bees are a little sick already, it can cause infections. Serratia is actually in the same family as E coli and salmonella. Neither group of bees were cool with being infected, but ~70% of the tetracycline treated bees died after 5 days whereas only ~25% of the untreated bees died. While antibiotics do protect the bees from foulbrood, antibiotic treatment seems to leave the bees primed for other infections. It’s like how you always seem to get sick when you’re really stressed. The antibiotic effect isn’t the only reason bees are having a tough time right now, but it is one of the factors that we should consider if we want to keep them happy and healthy for the future. Plus by doing these kinds of studies, we are learning more about how antibiotics affect gut microbiota which applies to humans too! So yeah, bees give us honey, but they could help us learn so much more. 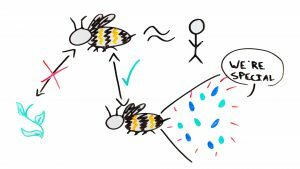 Information in the article comes from Raymann, Shaffer, and Moran “antibiotic exposure perturbs the gut microbiota and elevates mortality in honeybees” PLOS Biology (2017).